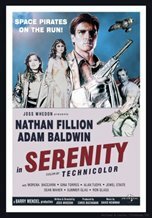 Brief Synopsis: "When the renegade crew of Serenity agrees to hide a fugitive on their ship, they find themselves in an action-packed battle between the relentless military might of a totalitarian regime who will destroy anything - or anyone - to get the girl back and the bloodthirsty creatures who roam the uncharted areas of space. But, the greatest danger of all may be on their ship." Bryan Lienesch 50 - Joss Whedon's initial transition from television to film is tacky, unpolished, and rife with poor acting. Ironically, it comes across as a TV movie.